A day has 24 hours. Deduct 8 hours for sleeping and an hour for other activities like grooming etc. You are still left with 15 hours which is a LOT of time! 3.Phone calls only rarely: I hardly spend time talking on the phone.The only person I call regularly is my mother.If I talk on the phone, it is usually while walking to my Art-course (I am doing a course in Human Portraiture). Only very few people (two to be precise apart from my mother) call me from India and usually while I talk to them I am cleaning up my bedrooms or making beds or putting the laundry for washing as I speak! 4. Focus and intense focus: If I am doing my yoga, I give it my 100% for that half an hour. I will shut out everything else and do only that. In India, people used to constantly ring my door bell but if I was doing my Yoga or my work-out there are times when I have not bothered to open the door :P :) If I am working on a piece of writing, I do not get up till I finish it. If I am doing a portrait, it will take a really important thing for me to get off it! I am sure these are no 'big secrets' and this is what most people who run a home must be doing. If you have any tips on how you efficiently organise your time or if you have any questions that you would like to know, I would be happy to answer! Current mood video (see right): Barry white Practise what you preach. wow! !thats a lot of inspiration again!! how do u manage to focus 100%...my fickle mindedness is something i have been trying to control for so long...never happens1! only thing i would have added is, having routine can be for some one who is learning time management.. it would help a lot.. later with practice, life becomes more of modular structure, with ability to place different modules (tasks) at different time slots of the day or merge them depending on the priority of the day. I love love love the quote :) - I am putting it as my gtalk status for some time :). 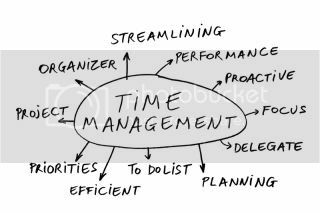 Great tips on time management.....cutting out TV helps so much - I am the same, except that I watch a lot of sports when they are on. Food - I don't like to cook and freeze or refrigerate, but I work full time so I cook only once a day...so yes it doesnt take longer than 90 mins :) and hubby helps with the grocery and cleaning and sometimes cooking too. Focus is the key....absolute must. A great post. I especially liked the fifth one as it's very similar to what I do, lol. Liked this post a lot!! No TV helps a lot - I accept!! I do cooking the similar way too!! I liked the 'focus-intense focus' part! :) Thanks for sharing your tips. I wish, I so wish there was something more productive I could do during my daily traveling time (which is very long -3hrs) :-( I read but I get so restless!! Have a nice weekend. Interesting..alot of what you said I do already..except that I am a film maker and there is no perfect order to things, I watch some soaps..but aha..I watch it like a movie. I have the dvds, I sit alone on my wasteful days and go through one episode after another..and that is why no routine helps..or else I will have no time to do anything except being a mom. Which I love btw. I am enjoying reading your blog. Cheers. You do have the secrets of getting time for things that u like to do and these are watching tv to the minimum, not spending long times on phone calls and above all total focus on a work at a time. People who complain of time have problem managing these things. NO TV????? That is unthinkable :) But, I guess, that is one of the most definite time-wasters. I, for one, make a mini to-do list mentally at the start of every day/week so I have my broader schedules in place. Then, the little gaps can be filled in, like you mentioned. There is another reason why you do so much... Its because you love everything you do. Most people I know, do things for the heck of it and are not passionate enough... be it their job or other things they do. Being passionate and interested about things you do goes a long way. Super post!!!! A lot of people shd benefit from this....including me;-P. Like u said they r no big secrets but reading abt it does make something in the brain go 'ping';-D.
No TV and no phone calls! Wow! Actually pretty much the same here. I long to watch TV! But I do manage to speak on the phone. I'm mostly returning calls, since I miss them all! TS: Thank you :) I like speaking on the phone but nobody bothers to call me from India. Maneesha; thanks a lot :) Happy it answered your questions. ani_aset:Thanks :) What kind of dancing do you practise? Seema: completely agree with you about TV! :) I do really enjoy watching movies though! Reflections: What does one do for more time than that? I can't imagine! Mamta: Thank you for finding out who the quote was from.Really appreciate. Love your insightful comments too. Yes I had never thought of it. I do love that I do! Palsworld: Happy you could take away something :) I do watch movies though! Roshan: i thought this was just plain common sense :P Not a 'secret' really. Thank you for commenting so regularly. I do appreciate. This is that: You said it absolutely right..Unless one manages one's time, there will be no time to be anything other than a mom! How old is your child/children? Thanks for your comments and glad you liked it! Lostworld: I save a lot of time as I dont have to do any travelling :)But good you get to read! Durga: happy it helped! I'd die of boredom if I was confined to a routine. Shachi: thanks a lot!! I too do not like to freeze or refrigerate. So i end up cooking fresh mostly. When you have kids it would be impossible to cook just once a day, if you want to give them fresh stuff. Mihir: yes I guess. But if you want to kill me all you have to do is force me to follow a routine :) I'd be dead by the end of the day! Pointblank: reflections also said the same thing. Maybe it is because my dishes are quick to make? Nischii: Thanks!! Yes--No TV..In fact it irritates me when people just sit in front of it like couch potatoes :P But I do love watching movies..I guess to each their own! Nice post. There is lots to learn from you.